How often do you see children copying what the adults in their lives do? This month, we'll see them throughout the challenge! Show us a pre-teen, or two, or more, acting like the grown-ups do. Are they pretending to be grown-up? Are they helping out the older folks? Are they dressed up, or just in the clothes they usually wear? That's up to you - but they have to be front-and-center in the renders. The Rules are in the usual thread, except that I'm exercising my powers as host to require eight freebies, not ten. A Word to the Wise: The forum's TOS says "Images that contain depictions of children are especially sensitive and will be reviewed even more strictly than other such images." I do hope this won't be an issue this month. As usual, DAZ3D is giving GCs to the creators of the first-, second-, and third-place entries, and Jaderail is giving GCs to all of these folks plus the Honorable Mentions. Once again, Mr Sparky has stepped forward with a gift of the winner's choice - any one product with only his name on it at Poser Direct. This will go to the first-place winner. 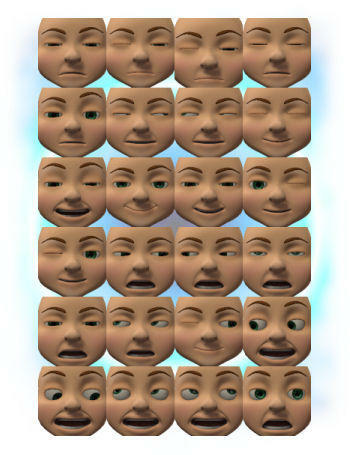 tiggersprings has donated an expression pack for 3D Universe's Dennis:Essentials. All of the Winners and Honourable Mentions will receive this gift. 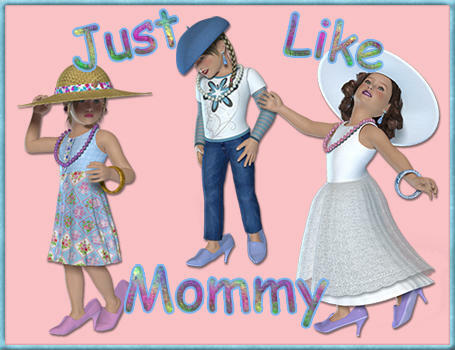 And trumarcar has donated an outfit for K4 - "Just Like Mommy". This will be going to the top three winners. Entry Gift: There might be one - watch this space! fictionalromance. Kismet2012, and Odaa have volunteered to judge this challenge. Thank you all! NAE - at least, not an entry for this month's Challenge. Folks who've been around for a while may remember this from the August 2011 Freebie Challenge. 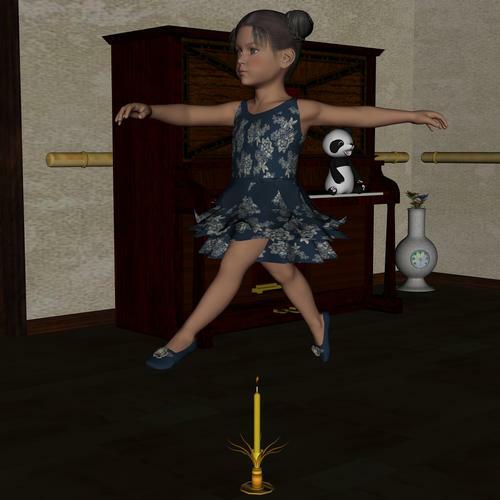 "If mommy can do a grand jete, so can I!" Such cool topic just after I uninstalled DS to free up some space... Poor soul :P.
This is a really cool theme. I have an idea but I have to figure out how to pull it off with freebies. NAE: Not enough free stuff in here...and not going to add more, besides it's an older scene that I was just playing around with to test various shader settings. I call it..."Look mom, it fits!" If you need a judge I am more than willing. Title: "When I Followed Daddy to Work..."
Neutral items: A3, H3, K4 and their morphs, Vyktohria's Gingham Shaders (freebie that is no longer available), Quiet Place (freebie on a rather NSFW page of the host website that I don't feel like linking to), Shoes from the H3 Etienne clothing set (not visible enough). All poses are modifications of ones that come standard with their respective characters. Paid items: Marielle Hair (on K4), The Hunter and the Hunted for Aiko 3 (human skin used on H3, vampire skin used on A3, cross props also used). Thank you, fictionalromance. I'm happy to have your help. Neutral items: A3, H3, K4 and their morphs, Vyktohria's Gingham Shaders (freebie that is no longer available), Quiet Place (freebie on a rather NSFW page of the host website that I don't feel like linking to). All poses are modifications of ones that come standard with their respective characters. Your link labeled "Still Life" is pointing to "Prince of Tides", and "REC Weaponry shaders" is pointing to an index page that starts with "REC Plushie Shaders". More importantly, it's extremely difficult to see the shoes H3 is wearing - they blend into the shadows so much that it's difficult for me to tell where they end and the cobblestones begin. But you have enough other freebies to qualify anyway. ENTRY ACCEPTED. If you could edit your post to fix those two misplaced links, I'd appreciate it. Winners have been announced in the February contest. Okay now I can turn my full attention to this month. I have lots of ideas so which one to choose! Sorry about that :( I had forgotten that REC's website was wordpress based, and that there were therefore individual pages for the freebies. I don't know what I was thinking when I put up the Prince of Tides link, but both have now been fixed. I also shifted Etienne shoes to the "neutral item" area. Thank you for hosting this, it looks like a fun theme. There may be more prizes - I've have a couple of "maybe" replies to my requests, and other gifts are always welcome. Watch this space. It's too soon to announce who or what, but I can say that at least one member of the KCTC is working on something... Keep watching this space. 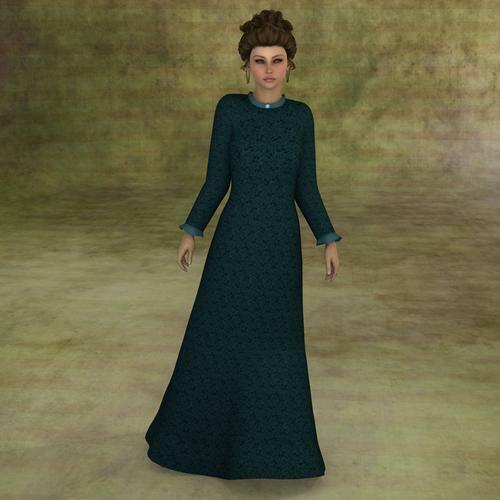 The backdrop image, the gown (and it's a rather bad conversion at that) and the hair are the only 'countable' items. What items are those? Can you link to them? You're too hard on yourself, Robkelk. As a host/jury member, you'd not be eligible to receive any prizes (I guess). I'd love to see some renders of yours. Yes I totally agree. The man with the most amazing freebie link database in the world! And I have posted a render. It's NAE - I submitted it to a previous Freebie Challenge, so it's already had a chance at winning - but it's there on the first page. Judges aren't allowed to vote for their own work, but they can win. ...now this one sounds like fun. is this where we post work in progress pieces, or is the thread the official submission?? this will only be my second contest, but i like the theme of this and would love some input. i will have the first draft by tomorrow. Maria decides to get a St Patrick's Day family portrait taken with Marc and baby Chris dressed for the holiday. Of course, the baby's having too much fun playing with the hat. archangel432 in this contest you only post your final work with the required 10 working links. Yes, this is the "official submission" thread. However, you are allowed to edit your submission two times.